This is pretty much the ultimate gamer nerd t-shirt. You have the 8-pixel character with the life force stuff and the fuel stuff. He’s got the shield, sword, and helmet. 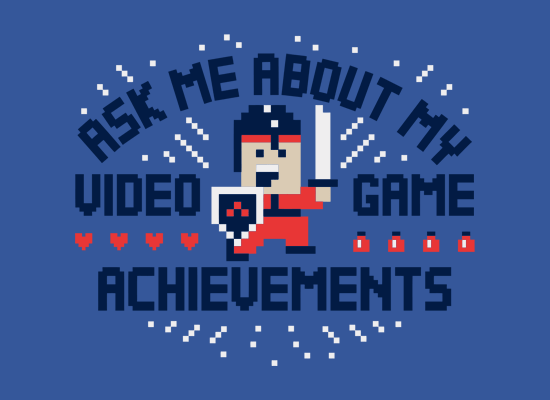 And, there wearer of this shirt is basically begging people to engage him in talk about gaming, so he can brag about getting to the 17th level of Missile Command, etc. If it’s another nerd the conversation will have statements like…ah, that’s nothing, I found the secret chamber with the whistling sword in Azeroth’s cave. I don’t know any else who has done this.